For some time now my husband has had this persistent cough, that mainly occurs after he eats a meal. Finally, he went to the doctor and he suggested going on this acid-free diet. There are details to the diet but we must be very strict for 2 weeks and the main things are: no garlic, onions, tomatoes, or spicy or regular peppers and of course no fruit, except for bananas, pears and some apples. Well telling me no garlic, onions, tomatoes or peppers is like well, I don’t know what!! I’d say the only dish I cook without garlic would be duck breasts with a fruit sauce!!! So we started this diet on Monday and I’ve been reacquainting myself with Herbs de Provence. I used it to roast a chicken last night and on some tilapia fillets tonight. Tomorrow I’m making striped bass fillets and if any of you have any suggestions, please pour it on. He also should have limited olive oil and butter, only skinless chicken or fish, no meat or fried foods. This is a great Sunday dish, as it does take some time. It’s a Melissa Clark recipe from The New York Times that I have altered, again. Not much, but I just can’t help myself. But I really do like Melissa’s recipes! She and I must be on the same wavelength. That’s the thing. There are millions of recipes out there. I pick the ones that I think I’m going to love, (based on the ingredients, time to prepare, ease of preparation, will it be fun to make?) If you make things you love, you will serve them with love – because love really is the secret ingredient! Now I did make a mistake in making this – had to do with not reading the recipe all the way through carefully. I threw in the scallion tops into the pot to roast with the chicken so you don’t see raw scallion rings in my photo. No matter, the dish was great – and different!! We all love chicken but we’re always looking for something different, right? Melissa talks about the daikon radish getting silky and she’s right. You’ll want to crawl right into this dish. Perfect for a winter night. I also used the stems of the mushrooms but I don’t think I’d use them again as they were a bit woody. Maybe save them to chop fine and use in a risotto later. 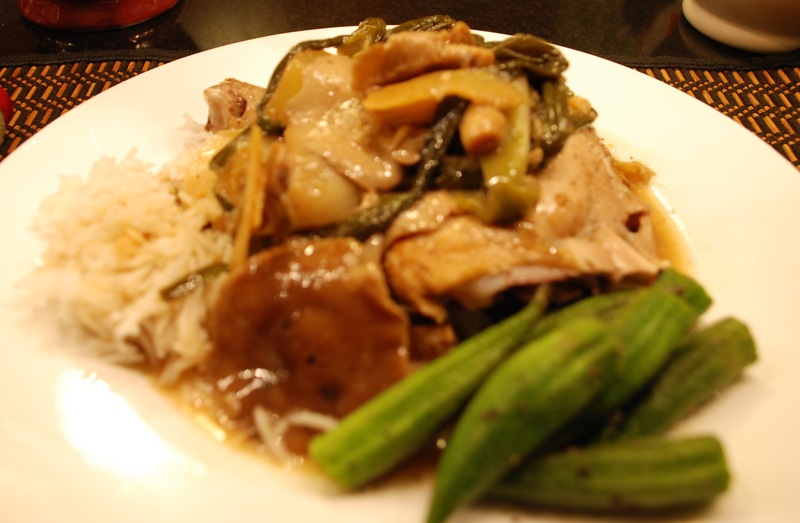 I served this with Jasmine steamed rice and some sautéed okra. It was yummy! Heat oven to 450 degrees. Trim the roots off the scallions. Separate the dark green tops from the bottoms. In a 5- or 6-quart Dutch oven, heat 2 tablespoons peanut oil and 1 1/2 teaspoons sesame oil over medium-high heat. Add the scallion bottoms, daikon, mushrooms and garlic cloves. Cook, stirring occasionally, until golden, about 7 minutes. Add the ginger and cook 1 minute more. Use a slotted spoon to transfer vegetables to a platter. Pat chicken dry; season inside and out with salt and pepper. Add the remaining 1 tablespoon peanut oil and 1 1/2 teaspoons sesame oil to the Dutch oven. 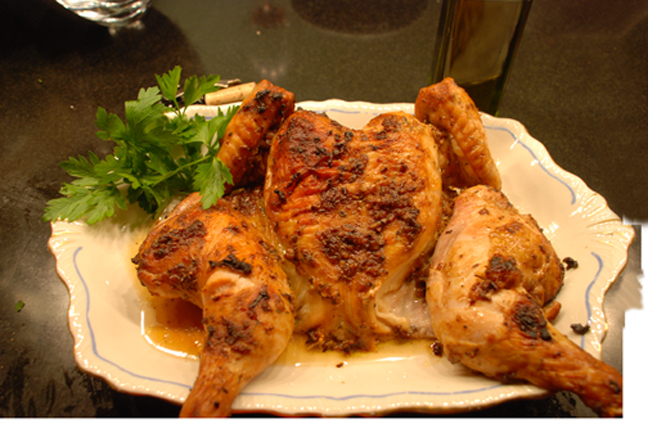 Brown chicken, turning, until the skin is well browned about 3 – 4 minutes on each of the 4 sides. Turn chicken breast-side up. Scatter the vegetables around the chicken. In a small bowl, whisk together the stock, sherry and soy sauce. Pour over the chicken. Drop in the star anise pods. Tightly cover the pot and transfer to the oven. Cook until the chicken is no longer pink, 40 to 60 minutes. Remove to a cutting board. Skim fat from the surface of the cooking liquid. Chop the scallion tops and stir in, with the vinegar. Carve chicken and serve, topped with vegetables and pot juices. They say that many a chef is judged by how good their roast bird is. I have tried many different ways over the years. Debating whether or not to truss the bird with string (Julia) or cut slits in the skin and shove the legs in there. (Anthony Bourdain) Starting with high heat to sear and then lowering it and basting it throughout (I still do like this method – more on that later) or Julia Child’s recipe that involves turning the bird every 15 minutes (more work) or Jen’s method (our long term nanny for the boys) of covering it and roasting it longer. My brother, Mark, thought hers was the best! When he would come to visit in NJ, he would request Jen’s chicken for the first night of dinners. Then there’s Zuni Café’s version of salting the chicken several days ahead of time (really a brining of sorts) and then roasting in a not too dissimilar way from the method I like below. Tell me your favorite! I think this is the best quick roasted chicken. Preheat oven to 450 degrees with a cast iron skillet or heavy ovenproof skillet in the center of the oven. Trim the ends off of your mushrooms, wash, pat dry with a towel and let air dry. Thoroughly wash and dry your bird, inside and out. Distribute and shove sliced garlic, along with the thyme sprigs, under the skin on both sides of the bird – both breasts and legs and both sides on the back. Be careful not to rip the skin. Take the half of lemon and squeeze it inside the cavity to refresh the bird. Salt and pepper the cavity. Place the squeezed lemon half in there, along with more sliced garlic and thyme and shove in the parmesan cheese rind. Pat dry the outside of the bird again, salt and pepper the outside. Take the pan out of the oven and leave a hot pad on the handle immediately so you don’t forget and grab it. Quickly put the bird in the pan, breast side up (it will not stick) and shove mushrooms all around. It will be snug and please remember this pan is blazing hot so be careful. 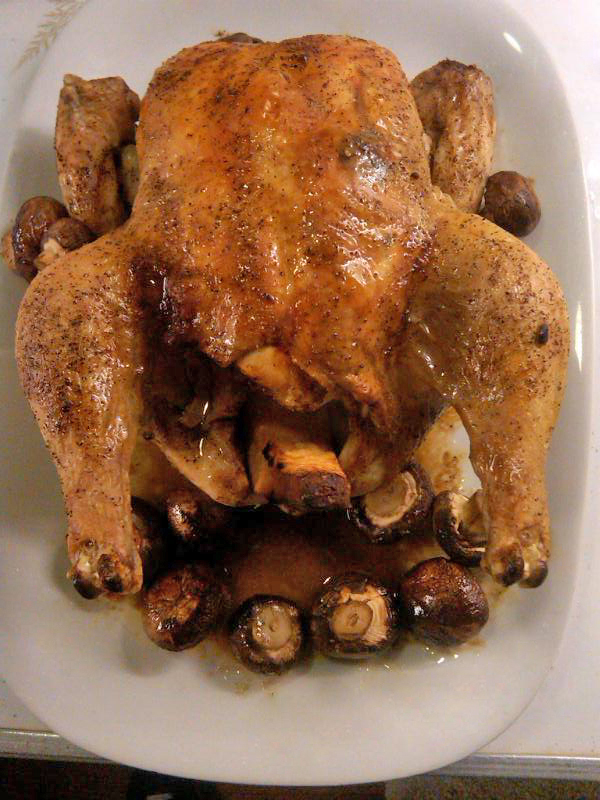 Now, you tell me if this isn’t the easiest and fastest way to serve a delicious, moist, mouth watering roast chicken? Last night I made April Bloomfield’s recipe of Lyon-Style Chicken with Vinegar Sauce and her suggested Herbed Steamed Rice recipe that’s in the October edition of Food & Wine magazine. It was scrumptious……. but boy was it rich and fattening! I just don’t usually cook like this. Actually, at The Breslin, one of April’s restaurants here in NYC, I can only eat a half of her lamb burger. And don’t let me fool you, I can eat. So I took a look at these recipes. Six tablespoons of butter for both, plus 3 tablespoons of olive oil and no draining of the chicken fat plus a quarter cup of creme fraiche. Well I was originally going to cut back on everything and then I thought, no. I’ll make it this one time her way. Well my husband and Zach loved it and I did too but it was just way too rich in the end. I felt the fat cells expanding on my hips as I was eating, and believe me, they do not need to do that. This is the thing. My cooking is full of flavor, clean and relatively low fat – meaning I really don’t use much butter. 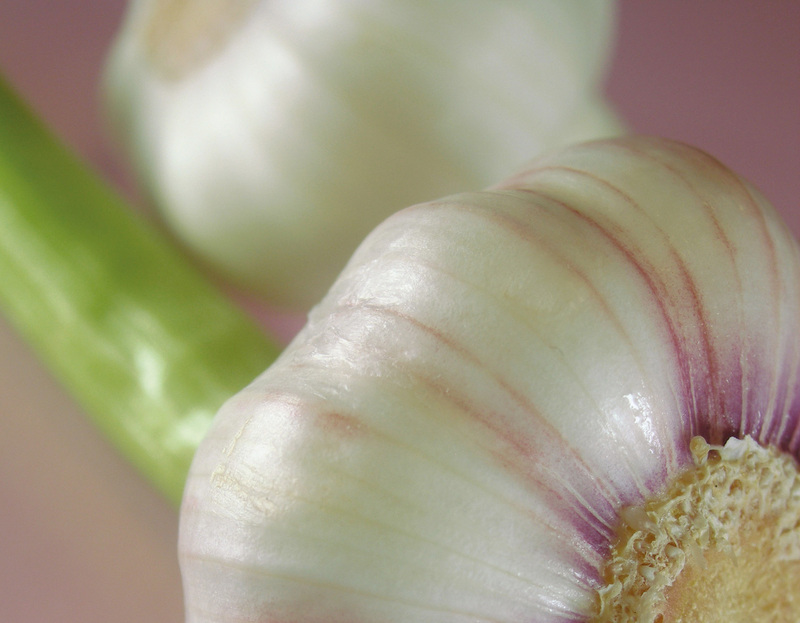 My big flavors come from lots of garlic, onions and all kinds of fresh herbs. I hope I can convince you that cooking this fresh way is not hard, gives you beautiful colors to play with and spreads your love to everyone around you, even in a healthy way! This is my son Zach’s favorite chicken. We make this over and over as you can get two recipes out of a quart of buttermilk and what else are you going to use that for? And buttermilk lasts a long time so you can do it 3 weeks apart. It is a take on a Nigella Lawson recipe as I have fiddled and changed it. Great for weeknight entertaining as you do the most work two days ahead of time. I hope you enjoy it as much as we do – and it’s super easy – with an easy clean-up to boot! Butterfly chicken by placing breast side down and using heavy-duty kitchen or poultry shears to cut along both sides of backbone. Discard backbone, turn chicken over and press gently on the breastbone to flatten. Place chicken in a large freezer bag. Add buttermilk, 1/4 cup oil, garlic, peppercorns, salt, rosemary, juniper berries and honey. Seal bag securely, massage all ingredients together and refrigerate for two days. Turn over and massage more during the two days, when you think about it. Take chicken out of the refrigerator 30 – 45 minutes before roasting. Heat oven to 400 degrees. Line a roasting pan with foil and use a rack. Remove chicken from marinade and place on a rack in the roasting pan. Drizzle with remaining 2 tablespoons oil. Roast for 40 minutes, then reduce heat to 325 degrees. Continue roasting until well browned and your meat thermometer measures 155 – 160 degrees in thigh meat, about another 10 -15 minutes. Remove chicken to a platter or carving board and allow to rest for at least 10 minutes before cutting into serving pieces.